This week's rock is what would be called a signature piece. It's been named "The Ribbon Rock" because the interference acrylic that is used on the rock looks like an interwoven, silky ribbon. 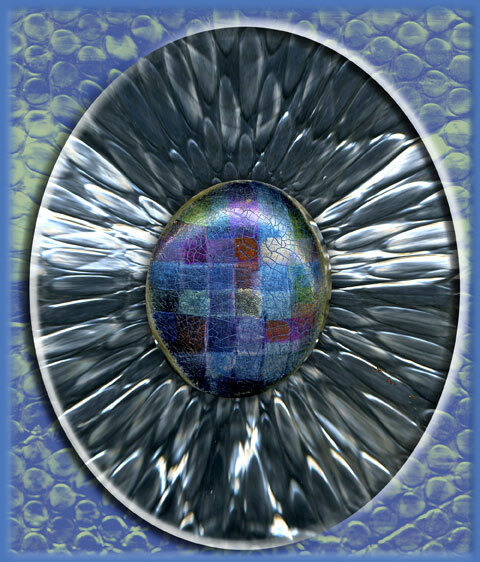 The image was brought into Photoshop and given a silver background using commercial tin foil that was scanned, pinched and modified using a standard filter.I also scanned some bubble wrap and created an oval frame to add to this piece.The whole picture will eventually be enlarged and sent to a local printer to create an 18" X 24" Poster. The Farmer's Market has been busy as usual, and it has been great seeing some of the regulars who come by to visit.It is guaranteed that their will be a fresh batch of Spirit Rocks there for your enjoyment. As of this writing (July 29th), as many as twenty new rocks have been added to the collection. Come check it our! 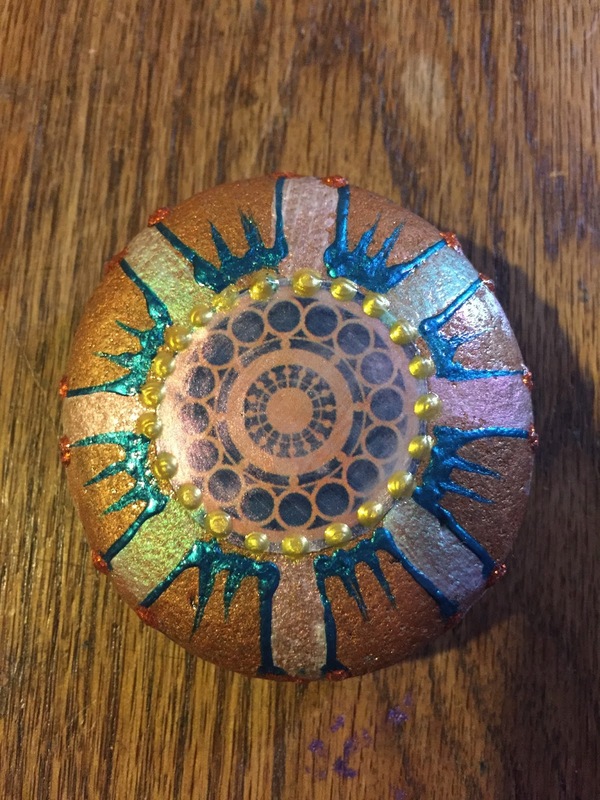 This rock is what I would call a mandala rock;In a way it somewhat represents a sort of Buddhist interpretation of the Wheel of life and what I understand to be the eight-fold path.The middle of the rock has sixteen circles which rotate around an inner circle that definitely looks like a wheel. This was not drawn by myself, it is a sticker which was printed. I covered the whole rock with a thick,clear coat of acrylic to protect the image. 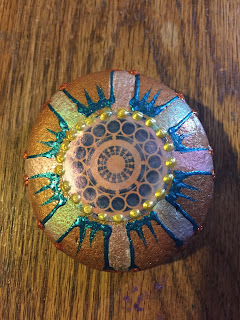 the only painting that was done was the rock itself and that which surrounds the medallion.